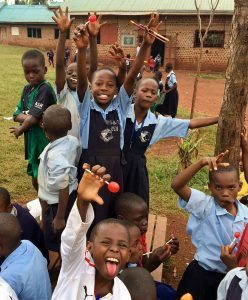 After completing a survey in 2016 The Good Gardeners team have drawn up this appeal for the Peters School near Jinja, Uganda. Mission: Enable the Peters School in Jinja, Eastern Uganda to have the first class HH-2 waste management system along with the HH-3 DRY Sanitation System. The first consideration is stop the risk of polluting the ground water from sanitation run off. The HH-3 DRY toilet system completely prevents this and enables the HH-2 waste management system to operate smoothly in its fertiliser making capacity which requires fresh pure water with which to do so. The wastes from the school and kitchens is all collected and processed through the HH-2 system which generates the right fungi and bacteria to quickly process these wastes. The end product HH-4 is then applied to the land and pest and disease free growing can commence. Sr Albert Howard achieved exactly this 100 years ago and the Good Gardeners are bringing back the science to spearhead its spread across Africa. 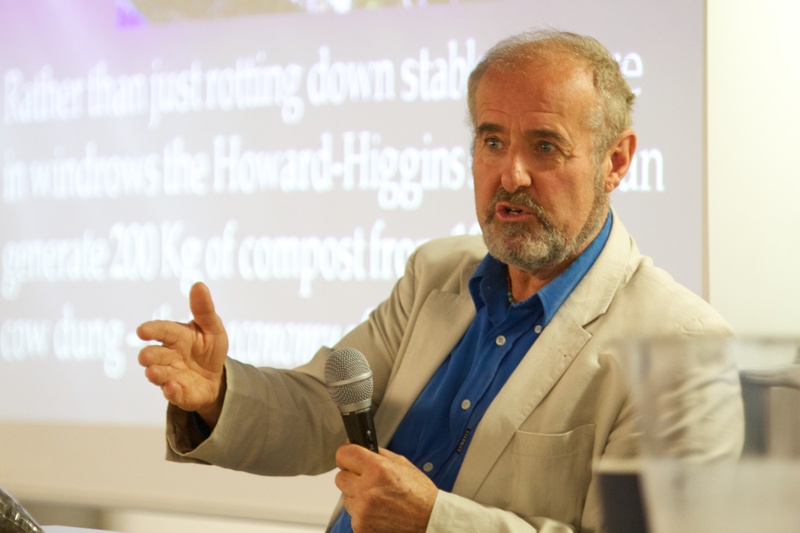 Richard Higgins – Project Director: Richard began a comprehensive study of the work of Sir Albert in 1995. He has developed the heat generating, HH-2, equipment directly from his works. This modern equipment that within the health and safety guidelines of the United Kingdom’s Environment Agency and the UK’s Environmental Health regulations. He lectures about this to the Soil Association and Universities in the UK. He has presented this technology to the UN in India and in Haiti to the UNEP and the UNDP where it was very well received. Richard will be presenting this unique and revolutionary growing technology at the next available International Conference of Aid and Development in Kenya. Sir Albert Howard was the founder of this science and the root cause of the formation of the Soil Association world wide. His work focused on soil health. This work and work in the same vein has to be revived if we are to replenish soil sustainability and avert agricultural disaster. You can find Richard’s Bio at the bottom of this page. Chief Operating Officer, with over 20 years experience in starting up farms and food processing businesses in Kenya. 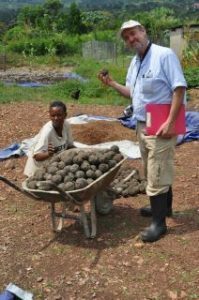 Anet, pictured left, is our Uganda Field Manager trained by GGI., in 2012. when we arrived in Uganda in 2012 she had already developed these cow dung cannon balls when she was previously employed by our partner, NorgesVel. These dried cow dung balls are spiked with charcoal which is made from our unique rocket stove design. We use them as an optimum cooking fuel in our rocket stoves which means new wood does not have to be cut to make charcoal. 2 1/2 billion world wide rely on wheat as a staple diet. The HH-2 system producing HH-4 prevents devastation of grain crops from stem rust and other diseases. Liase With The World – DOING! Further Developments – Train other schools/make and sell the valuable HH-4 fertiliser/soil conditioner that prevents all manner of diseases in the staple crops of the world. These include Black Rust in wheat, Yellow Rust in wheat and Stem Rust in wheat. This programme will empower the school to sell the excess fertiliser and receive commission from promoting sales of the HH-2 system. 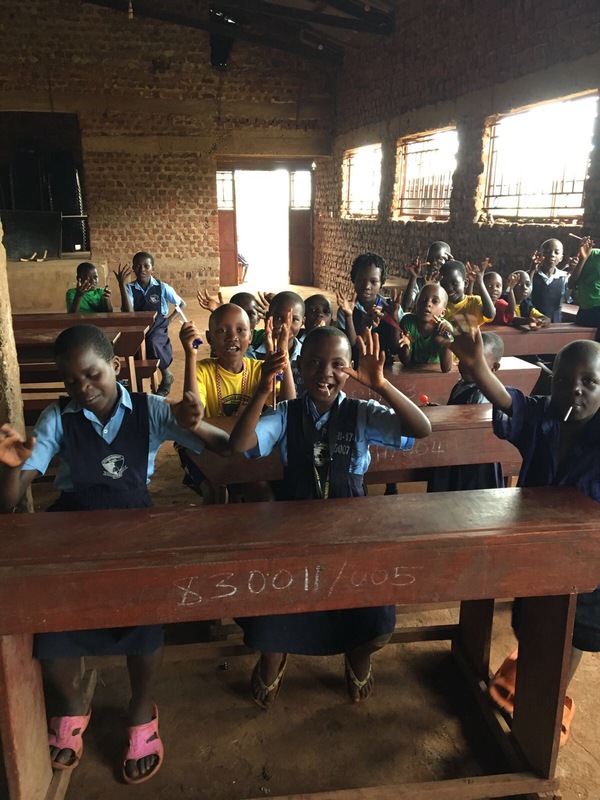 The Stiching Peters Primary School, a Dutch based Non-governmental Organization who role is to address the challenges of education and agriculture in Eastern Uganda was founded in 2005 with the goodwill and passion of Joan Machora and Peter Kruidenie. It lies in the Jinja region of Eastern Uganda. In 2008 the funding of the school was drastically reduced due to the European financial crisis that affected the Dutch partners. 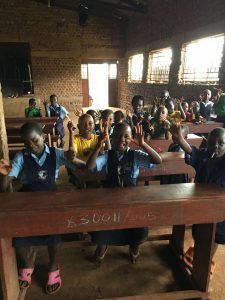 The school started admitting both orphans, whose education is free, and students who are able to pay fees so that the operational costs of the school would be met. In addition, the school has been practising farming to reduce the cost of food and to help educate farmers in the community. The HH-2 System actually prevents pests and diseases from devastating crops without having to buy any chemical fertilisers, pesticides and herbicides etc., It is an essential element in the push for increased food security for Africa. 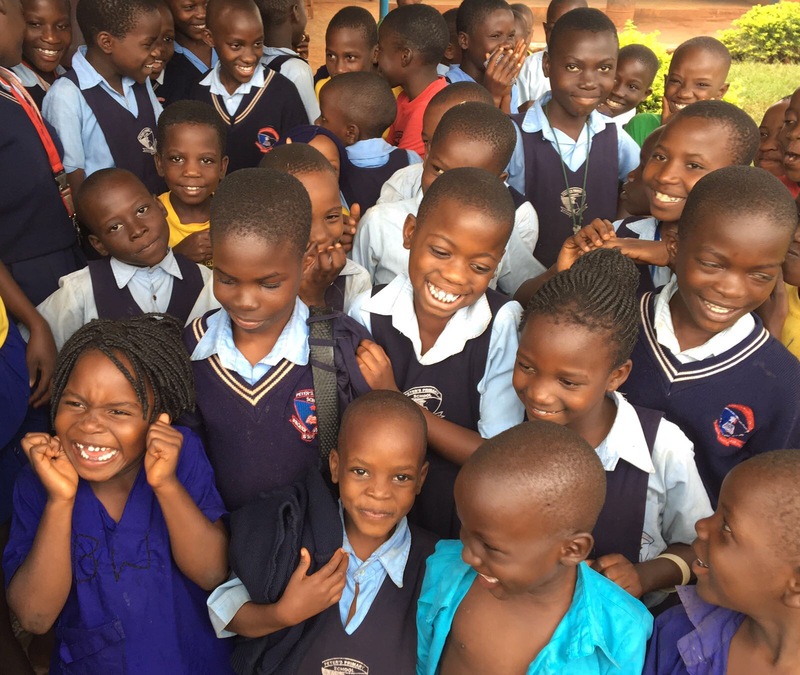 In 2015 the school also opened a Nursery school for children below 7 yrs. The story of this project began in 2012 when Richard Higgins, Director of Good Gardeners International, was contracted by Norgesvell to do a scale up project of this HH-2 sanitation and waste management system in Kampala. At that time he surveyed four other larger schools. All the schools he surveyed wanted to adopt the HH-2 Horticultural System with DRY sanitation and grow their own food. All the schools surveyed had large amounts of land but were buying everything from markets in the town. Food security is increased by more people growing more food on the vast areas of uncultivated land. It is the simplest agricultural/horticultural system there is and as such anyone can operate it without conventional agricultural training. More people in Africa send their children to school in Uganda than any other country in Africa. And Uganda has been coined as the possible bread basket for many other countries. Then on a subsequent exploratory survey mission in summer 2015 with Brendan Greene (20 years in Africa), we connected with Joan Machora . After discussion with Joan, Richard Higgins, CEO of Good Gardener’s Intl and Brendan Greene, set off to Eastern Uganda to survey her school. Currently, there are 630 pupils and staff at this school, and most of them are boarders. We plan to install the Good Gardeners, HH-3, DRY toilets that will serve the staff and all the pupils and the HH-2 Horticultural System that will enable them to replenish their soil which will greatly increase their food security and the nutritional content of their food. It is a fact that the soils of Africa are much depleted and this is the cause of malnutrition. GGI wishes to convert the existing toilet blocks to accommodate their DRY HH-3 toilet units. These work in conjunction with our specially insulated HH-2 units. Together these two will promote safe drinking water and safe waste disposal thus giving a healthier environment for the children. The system processes all forms of sanitation waste, in conjunction with all the garden and kitchen waste generated in the school. The HH-2 Horticultural System makes all these wastes into an optimum fertiliser in 90 days which is so powerful it actually prevents all kinds of pests and disease when used in the HH-2 growing system as it does on our demo farm in South Hertfordshire, England. Over the fifty years that the Good Gardeners have been trialling the no dig system of growing they have had no serious pests or disease in any of their crops. This is due to the consistency and reliability of the fertilising end product known as HH-4. The plants are provided with such a high state of nutrition that pests and diseases just don’t attack them. Sir Albert Howard, the originator of this science, said that pests and disease were indicators that something was wrong with the fertility of the soil and that something had to be done to improve it. The HH-2 system is that solution as it generates the right fungi and bacteria that enable fully healthy crops to develop. Once the system is installed and the staff trained in the operation of the new toilets and the horticultural growing system (no dig) other schools can come and learn how this will be possible for them to adopt. The work the Good Gardeners Charity is performing is essential for the establishment of sustainable food security. Joan along with Good Gardeners Intl plans to spread the word outwards and affect change in other communities. Once funding is secured for this project, they can also set up as a centre for training other schools with the Good Gardeners solution for sustainable sanitation, good waste management and pest and disease free crop production. The HH-2 Horticultural System that employs all manner of crop and household wastes are transformed into an optimum fertiliser in 90 days. No nitrogen is lost and being applied to the ground without digging or ploughing it achieves maximum carbon sequestration. This no dig system is the most effective carbon sequestration system. 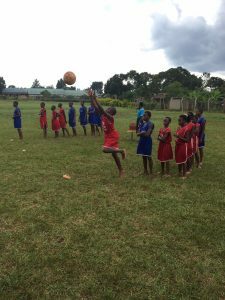 This will qualify such schools as having a carbon negative footprint and could attract government awards, funding or subsidy.